Enjoy a beautiful forested setting humming with wildlife on a Botswana Safari at Kwando Lagoon Camp, which overlooks the Kwando River and Namibia's Caprivi Strip. This is Big Game country and Wild Dog territory. This Botswana safari lodge is the place to be in the winter when thousands of Elephant and Buffalo move into the area. Predator interaction is inevitable and so an age-old drama unfolds. As a guest at Kwando Lagoon Camp you will have a ring-side seat for this spectacle. 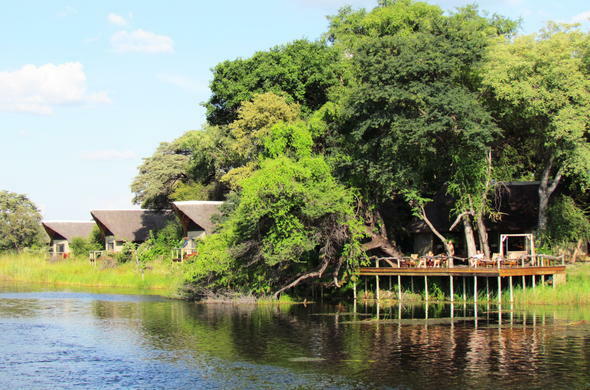 The Kwando Lagoon Camp enjoys an excellent location for watching wildlife at the waterside. Game viewing could include sightings of the resident clan of Wild Dogs, as they den in a nearby location. Game drives with an expert guide and tracker team take you on daily adventures in search of game, with off-roading and night drives as part of the experience. You can also set off on superb sunset cruises aboard a unique double-decker craft where, sundowner drink in hand, you'll be able to bird watch and observe game at the water's edge as you drift past. Fishing enthusiasts can drop a line off the boat as it moves along. Summers are warm to hot with high humidity and animals are scattered all over the lush open floodplains. The dry cool season is from May to October and waterholes and pastures dry up. Animals then congregate in large numbers by the river. Lagoon camp is ideally situated near the Kwando River, a renowned area for Elephants, Buffalo, Wild Dog and Lions.